Annie Hewitt is delighted to become an Actor in Residence for Playwrights’ Platform. Recent happy work was her film debut in Sisyphus Dunking, for the 2017 Boston 48 hour Film Festival. Locally, she performed on stage in An Inspector Calls with Arlington Friends of the Drama. 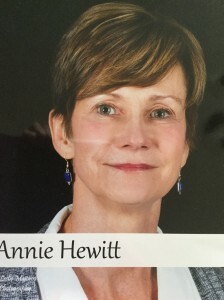 Annie has studied Acting and Improv with Art Hennesey and Amanda Goode Hennessey and Voice-Over/Acting through Boston Casting.